That is very nice. Thanks. Very colorful. Life can be a lot less expensive if one’s world needs are reachable on foot or by bicycle. Not have a car in Los Angeles, (until the advent of Uber, at least), was considered so life-limiting as it’s so impractical to walk or cycle back and forth to work or to friends 5, 10 or 20 miles away. We are that spread out! It seems that the various needs of people are closely packed in each location. So there will be folk to entertain, repair shoes and sell vegetables in almost every few streets. Sociologists must have a ball looking at the ways humans build communities with local identity and resources. So did you get to watch the performances. Do they do this to just get extra money or this is sufficient to support their needs? Again a nice analysis Asher. No I didn't follow them to their traffic light and I'm sorry I didn't. I don't know the answer to the economic question but something that is interesting is they may not even be Colombian. 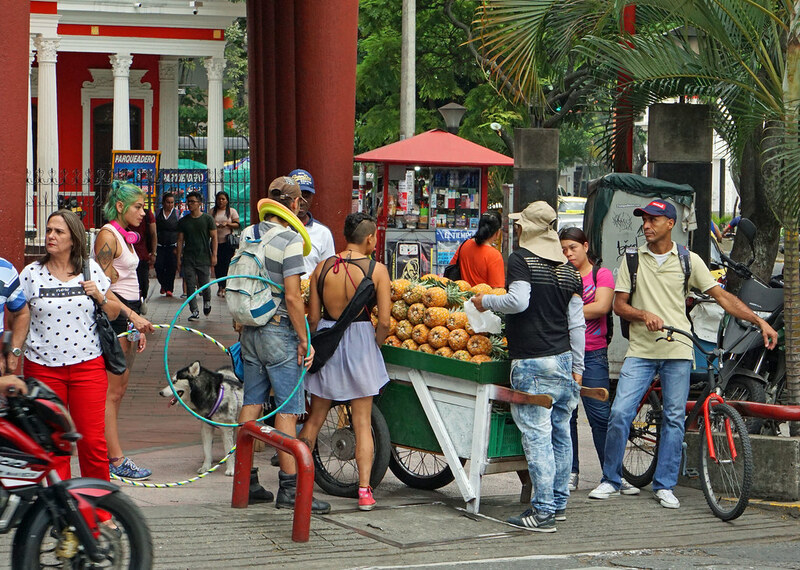 Mostly during the Christmas season but at other times of year as well street performers come up from Argentina and other countries to see what they can earn at the traffic lights in Colombia's major cities. Why would Argentinians want to perform in Colombia as opposed to their own cities and villages. Is it that Colombians are less “industrialized” and more down to earth and playful and so their presence is more welcome and the money comes in faster? You got me Asher but it's a phenomena that's been going on for years. They also show up in droves in El Centro (a huge bazaar downtown) during the Christmas season to sell Chinese knockoffs. As to the performers they might just want to travel and earn the money on the street to pay for it. I'm not sure why but the Colombian economy seems to be attractive to foreigners from other South American countries. Obviously Venezuela would be out of the question as a destination. Life can be a lot less expensive if one’s world needs are reachable on foot or by bicycle. The reality is that everyone is alone together here in the big city of Vancouver. We used to have communities and neighborhoods but now we have residential districts and strip malls. Soccer moms driving kids all over hells half acre just to get them to school and buy groceries. Lots of folks just dreaming the dream. Of course there is the odd community where others dream a different dream and lead alternative life styles. They eat organic food, ride their bicycles, skateboards, and seem to spend a great deal of time getting tattoos. I don't know how they earn living looking the way they do? So I have conclude that they must all be independently wealthy.